Techies Sphere: This device can’t use Trusted Platform Module (BitLocker Drive Encryption). This device can’t use Trusted Platform Module (BitLocker Drive Encryption). Or, BitLocker Drive Encryption Error: This device can’t use Trusted Platform Module. 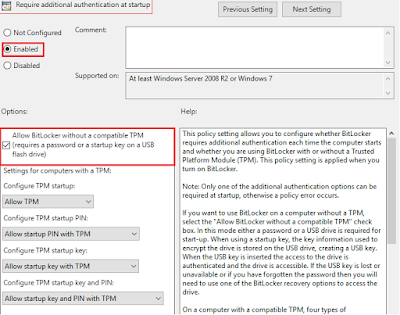 Your administrator must set the “Allow BitLocker without a compatible TPM” option in the “Required additional authentication at startup” policy for OS volumes. Or, Windows 10 BitLocker drive encryption error “This device can’t use Trusted Platform Module”. When you are trying to enable BitLocker Drive encryption, you are getting the above error message. It’s just because of your computer is not having TPM (Trusted Platform Module) or TPM is not enabled in BIOS of the computer. Anyways, I am taking scenario where your computer is not having TPM. So, now the magic is, you can even enable BitLocker Drive Encryption without a TPM in your computer. To get it done, you have to just enable a Single policy object on your local computer by going to gpedit.msc. Below is the explanation “How to do it?”. 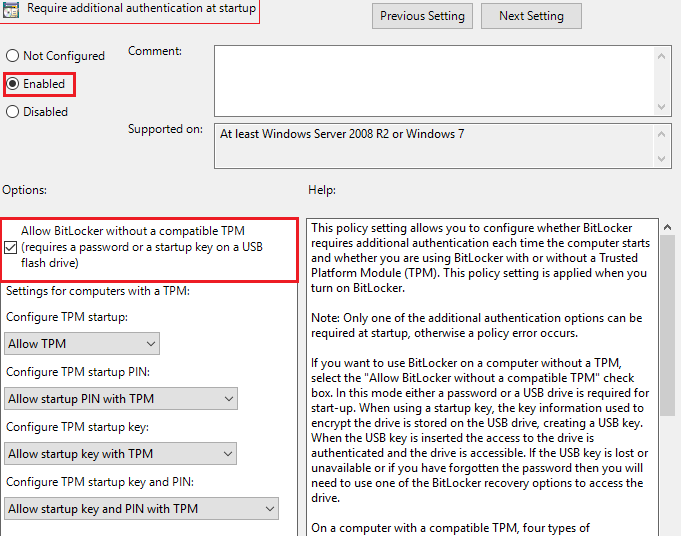 Enable Check mark on “Allow BitLocker without a compatible TPM” > Click on OK > Re-initiate the Drive Encryption, it should work..
Good Luck. Please write me back if you have any query or feedback on this..